The Globel Shed G83 is a premium slim garden shed with sliding doors and Gable Roof. Great for smaller backyards with little space. The Globel Shed G83 is a slim garden shed which is great for smaller backyards with little space. The G83 is 2.34m (Width)x 0.82m (Depth) x 1.78m (Height) and designed to sit against a wall or fence and provides a wide but narrow storage shed. Slim sheds are very popular and can also be placed inside garages or on patios. 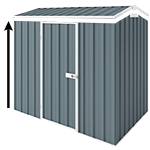 Globel Sheds is a premium imported garden shed range which has been custom designed with all the most popular features Aussies love, including high quality steel and finishes. These premium sheds were designed by Aussies and distributed by the owners in WA. Although imported they are high quality and been tested to meet our standards. Home Delivery is NOT available - for Depot Pick up only.